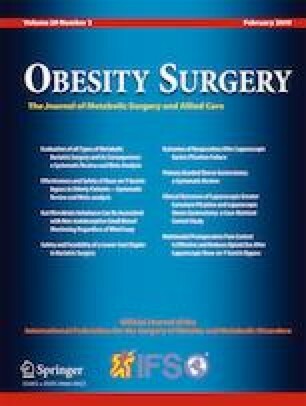 The aim of this study was to evaluate the influence of bariatric surgery on gallstone disease in obese patients. This large cohort retrospective study was conducted based on the Taiwan National Health Insurance Research Database. All patients 18–55 years of age with a diagnosis code for obesity (ICD-9-CM codes 278.00–278.02 or 278.1) between 2003 and 2010 were included. Patients with a history of gallstone disease and hepatic malignancies were excluded. The patients were divided into non-surgical and bariatric surgery groups. Obesity surgery was defined by ICD-9-OP codes. We also enrolled healthy civilians as the general population. The primary end point was defined as re-hospitalization with a diagnosis of gallstone disease after the index hospitalization. All patients were followed until the end of 2013, a biliary complication occurred, or death. Two thousand three hundred seventeen patients in the bariatric surgery group, 2331 patients in the non-surgical group, and 8162 patients in the general population were included. Compared to the non-surgery group (2.79%), bariatric surgery (2.89%) did not elevate the risk of subsequent biliary events (HR = 1.075, p = 0.679). Compared to the general population (1.15%), bariatric surgery group had a significantly higher risk (HR = 4.996, p < 0.001). In the bariatric surgery group, female gender (HR = 1.774, p = 0.032) and a restrictive procedure (HR = 1.624, p = 0.048) were risk factors for gallstone disease. The risk for gallstone disease did not increase after bariatric surgery, although the risk was still higher than the general population. The benefit of concomitant cholecystectomy during bariatric surgery should be carefully evaluated. Wen-Yao Yin and Cheng-Hung Lee contributed equally to this work. A correction to this article is available online at https://doi.org/10.1007/s11695-019-03745-3. This study is based in part on data from National Health Insurance Research Database (NHIRD), provided by the National Health Insurance Administration, Ministry of Health and Welfare and managed by the National Health Research Institutes (registered number NHIRD-103-246). The data utilized in this study cannot be made available in the manuscript, the supplemental files, or in a public repository due to the “Personal Information Protection Act” executed by Taiwan’s government, starting from 2012. Requests for data can be sent as a formal proposal to the NHIRD (http://nhird.nhri.org.tw) or by email to nhird@nhri.org.tw.